*Prices are based on a single shared room: larger families will need to contact us for prices as rooms only accommodate up to four people. Price does not include airfare or transportation to the hotel, three dinners or "add-ons" noted in the itinerary below. 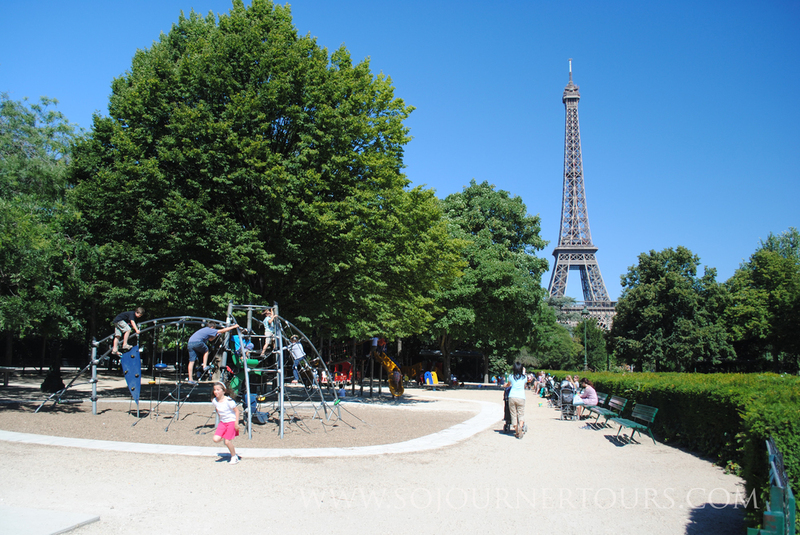 At Sojourner Tours we believe Paris is better with kids. We design each family tour to enable you to effortlessly discover (or rediscover) this extraordinary city as a family. Unlike the majority of misleadingly titled “family” tours that claim to be for travelers “with” children but then focus mainly on the children, Sojourner Tours addresses the dual needs of you, the adult, and your children. Sojourner Tours owner, Lisa understands that a good family trip involves a simple balance of strategically condensed adult pleasures interspersed with child-centered activities. Each day contains kid-tested activities enhanced with information drawn from the owners' educational, professional and Franco-American backgrounds to make your vacation the rich, meaningful exploration of the local culture and history for you and your children. 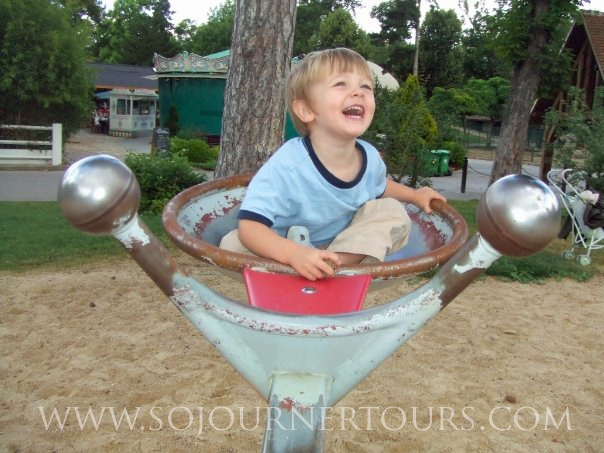 Sojourner Tours' goal when designing family itineraries is that even frequent visitors to the city will leave feeling that being with children deeply improved their trip. 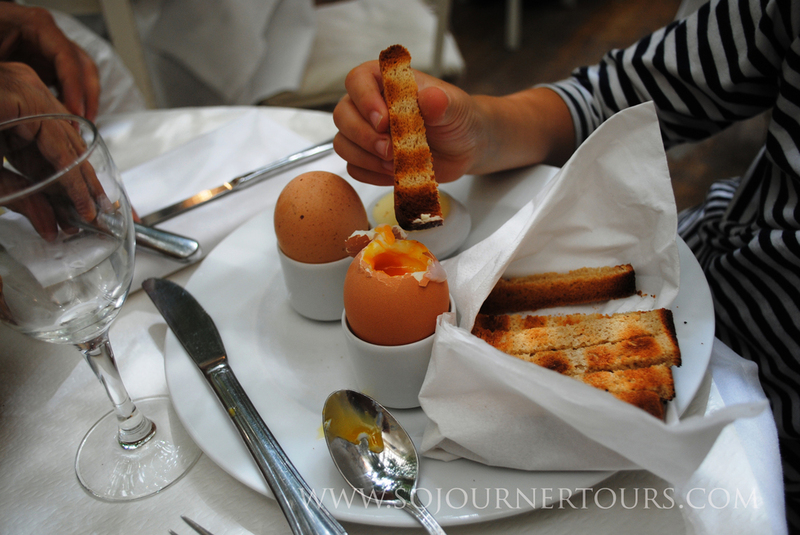 Family tours are also designed with economy in mind and includes the opportunities to splurge. You'll notice that there are several "add on" options over the course of the week and there are three dinners when you choose exactly where and when you want to eat and if you want to splurge. Rooftops views of Paris from atop Notre Dame and Sacre Coeur. Lisa Gustavson (the owner, founder and CEO of Sojourner Tours who is also a part-time professor of French at Southwestern University) and Francis Mathieu (co-owner of Sojourner Tours and tenured French professor at Southwestern University). Lisa and Francis are the parents of two Franco-American boys born in 2005 and 2008. CLICK HERE to read more about how your guides met and decided to start Sojourner Tours. Arrive in Paris, "The Center of the Universe"
AFTERNOON: Upon arrival, you can settle into your room in the centrally located hotel where you'll be staying with the other tour participants. While other guests are still arriving, you can start to explore Paris on your own or relax at the hotel. RECEPTION & DINNER: Join us in the hotel dining room to celebrate the beginning of your tour French-style with a typical apéritif with playful activities to get the children excited about the upcoming Parisian adventures and a laid-back tapas-style meal with lots of fun finger food to try. 9:00 am Meet in the Hotel Salon, located between the reception hall and the dining area. MORNING: When the children are at their freshest and most engaged, we’ll head to the Louvre where we’ll break into groups for a themed scavenger hunt that will keep the children engaged and excited to explore the museum and find particular works of art. They’ll catch sight of the gigantic Ferris Wheel where you’ll end today’s stroll. Following the museum, we’ll stroll through the Royal Palace courtyard so the children can have a chance to run around and stretch their legs climbing on the contemporary art columns, les Colonnes de Buren, while you stroll around the courtyard or window-shop in the luxury stores. LUNCH: You’ll have lunch in a typical French bistro in an atypical location. We’ll reserve a table on the terrace of a charming 19th century covered pedestrian shopping passage so that the children have the freedom to play safely in the mosaic corridor near the table while you have a leisurely lunch. 2. 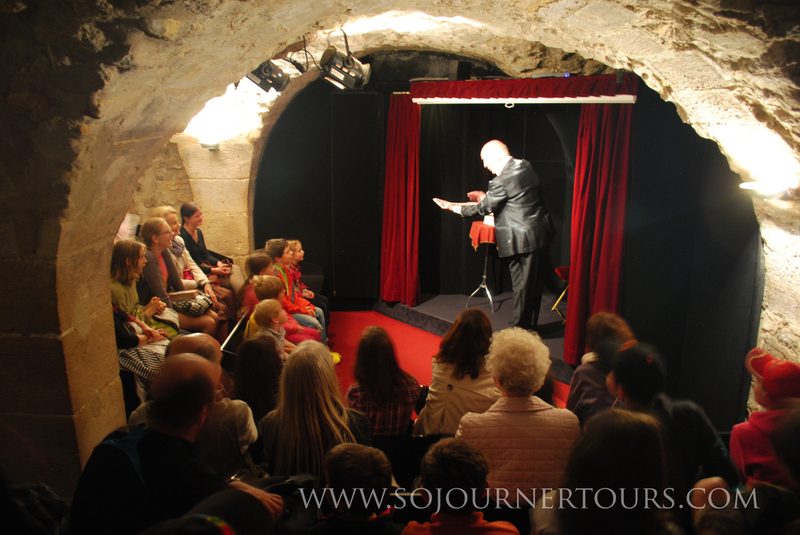 Continue your guided tour of covered passages and Grands Boulevards with your other guide. The covered passages were predecessor to the department store. 3. Explore the Grand Boulevards at your own pace. 1. Join the children who are headed to the Fragonard perfume shop where they can learn a bit about the history of perfumery in two Napoleonic Town Houses and have an ice cream at a shop where each flavor your child chooses will be a petal of their ice-cream flower. 2. Browse in an English bookstore. Then, it’s the moment the children have been waiting for: you’ll ride the Giant Ferris Wheel and see out over Paris. EARLY DINNER We’ll try to find a spot near the large fountain to picnic where your children can enjoy a traditional French game of pushing wooden boats. 9:00am Meet in the Hotel Salon. 2. Head out with the other guide for a walking tour of Monmartre and pick up some pastries for the group at one of France’s best pastry chef’s boutique. Both groups will meet back up in a small neighborhood playground well –hidden behind a stone wall just behind Sacré Coeur. LUNCH: While Place du Tertre draws throngs of people to its tourist-trap bistros, you’ll be slipping away from the crowds to the little known residential area behind the hill where you’ll eat in a neighborhood bistro that is popular with Parisian families. 1. Stay in Monmartre. First you’ll stroll over to a large neighborhood park with one of your guides to eat the pastries and have some serious time to play. Then you’ll have free time to explore the area on your own. DINNER: You will be free to select your own restaurant for dinner (your guide will be happy to make recommendations). 3. Skip the museum to explore this shopping district neighborhood at your own pace with your family. LUNCH: Today you’ll have street food for lunch. You are spending the day where the aristocracy lived in the 17th century; part of which is now one of Paris’ Jewish neighborhoods, so naturally you’ll want to try the city’s best falafels or a kabab! You’ll take your sandwich over to a playground to eat so the children can play once they’ve finished eating. AFTERNOON: After lunch, you’ll pop in one of the 17th century manors to see how the aristocrats lived on your way to the Place des Vosges where the children will play in a small playground while you have the option of visiting Victor Hugo’s house museum or popping in the boutiques around the square. Next, your guide will take you on an insider’s stroll through a hidden passage a little known square for an afternoon snack where the children will have space to run around. Then you’ll go to a somewhat secret antique village where you’ll have the choice of browsing on your own or accompanying the children to the interactive museum of automatons and magic. 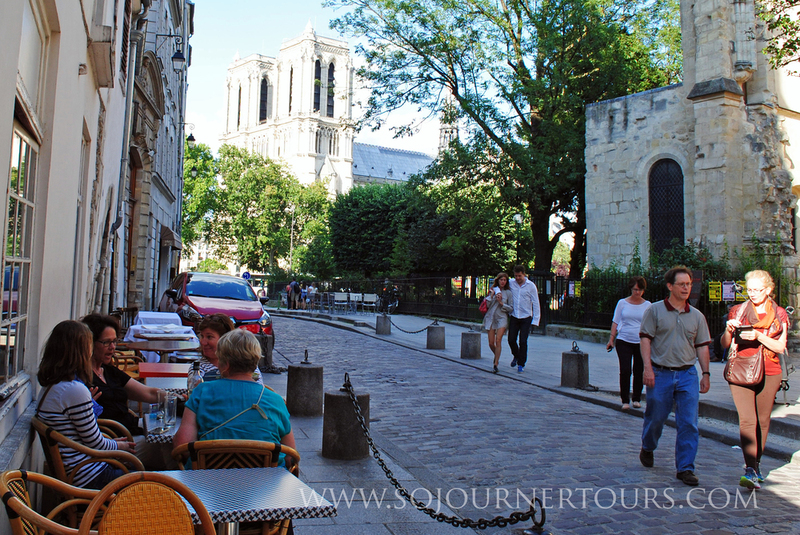 LATE AFTERNOON: You’ll walk past medieval timber-frame houses through another secluded city square and over the bridges to the islands which were the initial settlements that eventually grew into Paris. The Ile St Louis is home to Paris’ most renowned ice cream maker so you’ll have the surprise of a mini scoop with maximum flavor to enjoy as you stroll over to Notre Dame. Right behind the Cathedral, we’ll take a break for the children to run around in the garden. 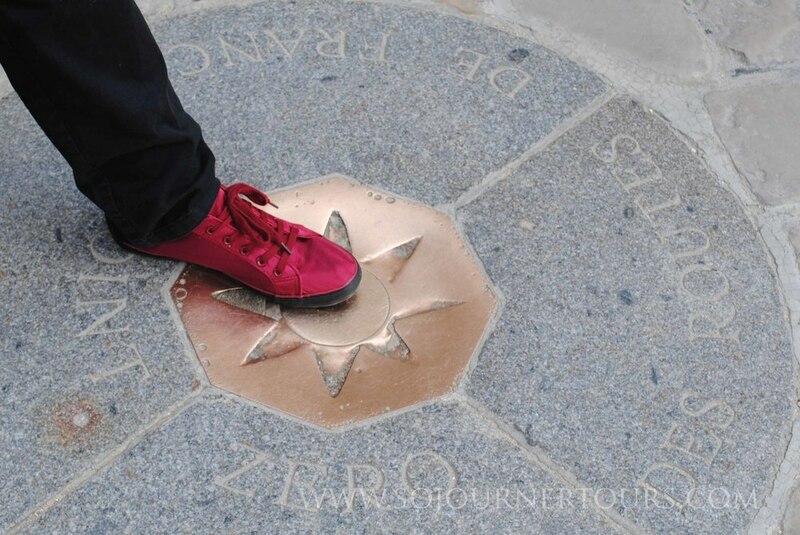 Then we’ll head to the front of the Cathedral to find the central point of the entire country of France from whence all distances are measured. Finally we’ll ascend to the top of the towers for sweeping views of Paris. The rest of the afternoon is free time so you’ll have time to visit the inside of the Cathedral with your family at your own pace or wander around the Latin Quarter where lots of restaurants and street vendors are located. Very light physical challenge: 2-3 miles of city walking. 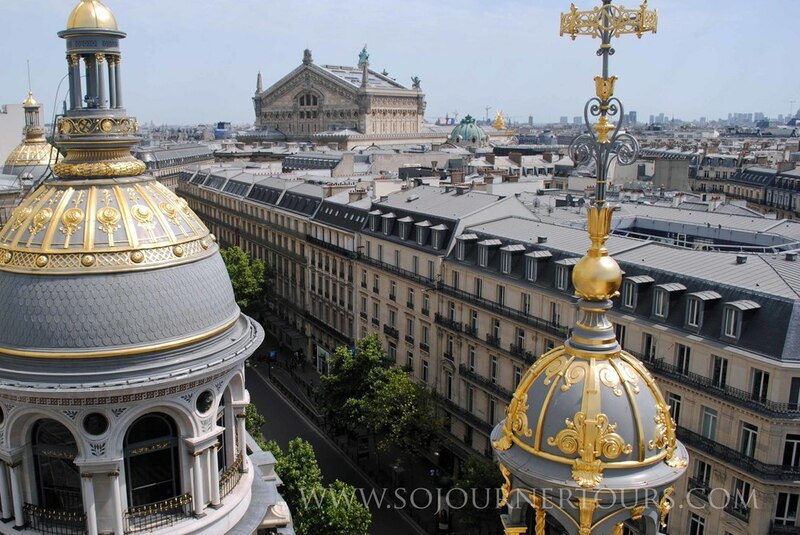 MORNING: Starting at the Arts & Métiers Museum, you’ll pop in the chapel to see the Foucault pendulum and the flying machines suspended from the chapel ceiling. LUNCH: You’ll stroll over to the Marché des Enfants Rouges for an early lunch, stopping briefly to play at a playground on the way. This market is positively bustling with locals at lunch time so we’ll be sure to arrive before the crowds. 1. 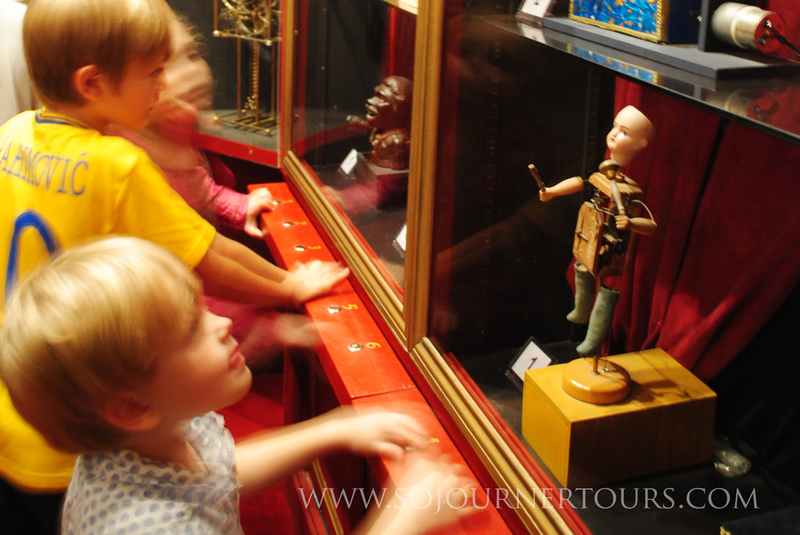 Join the children to wander through the artistically designed interactive museum where they can pull open drawers. 3. Explore the neighborhood on your own. Take a quick peek in the mansion that houses the National Archives as you stroll over to the park near the doll museum where you’ll meet back up with the children. LATE AFTERNOON: It’s time for ice cream! Choose as many flavors as you want in an Italian gelato shop that will transform each scoop into the petal of an ice cream flower atop your cone. We’ll enjoy it sitting on the side of the playful Stravinsky fountain. FREE TIME: You’ll have family time to visit the Pompidou Art Museum (ADD-ON : €14/ adult, free child), explore the neighborhood, or stroll over to the Chatelet park and shopping district. MORNING: Free time until 11:00. 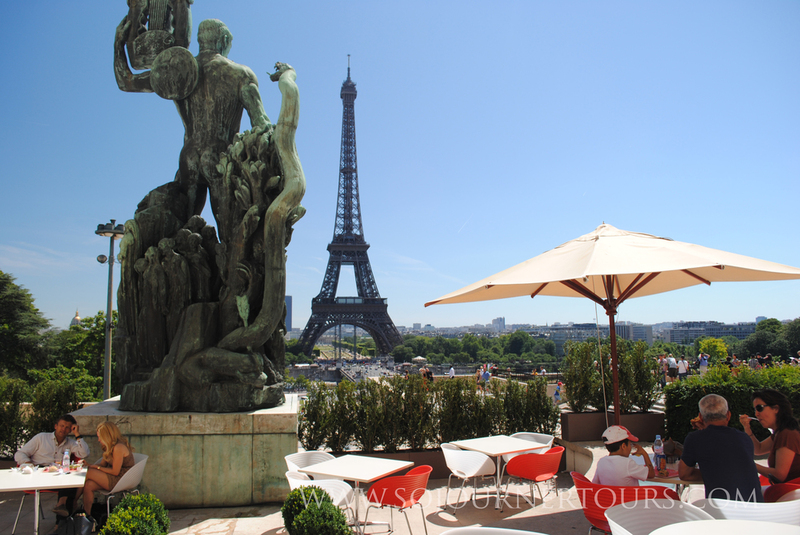 Arrive at a permanent market street which you’ll stroll down on your way to the Eiffel Tower. The Eiffel Tower was designed as part of the World Fair and today your family will see the sights around the tower in the spirit of the fair for which it was built. First, you’ll stop at a playground near the tower so the kids can get the wiggles out before their fabulous sit down lunch. LUNCH: This is the big moment! You'll go in the restaurant's private elevator (skipping the lines!) to the very top of the tower for a three course meal in the fancy Jules Vernes Restaurant ! You’ll meet back up with the group in a small playground. From there, the group will stroll down to the beautiful garden of the Fashion Museum where the children can run a bit. Then your group will take a pedestrian bridge over to Paris’ new and greatly adored Quai Branly Museum of Tribal Artifacts. Visit the museum at your own pace with your family or join the guides who have prepared a treasure hunt to engross the tired children in the displays of this marvelous museum. FAREWELL DINNER: For the final evening in Paris, a special treat is awaiting the children, they’ll stay up late for an evening dinner cruise on the Seine River to see the city of lights one last time from the water: you’ll cruise back past the Louvre and Notre Dame while also discovering new sights.